The VEX ARM® Cortex®-based Microcontroller, VEXnet Joystick and VEXnet Key 2.0 contain their own internal processors and run special software called firmware. This firmware is what allows for advanced programming features and an enhanced user experience. The best way to ensure that your VEX EDR system is functioning properly is to keep the firmware up to date. 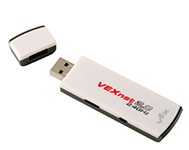 Visit the VEX EDR Firmware page for details on updating your VEXnet devices. Click Here to Sign Up for VEX EDR Firmware Update Notifications! Sign Up for VEX EDR Firmware Update Notifications!